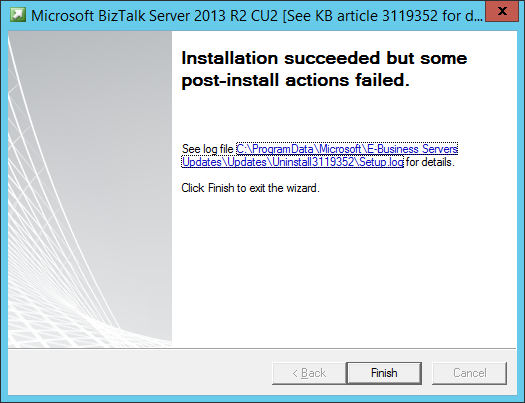 When you install BizTalk 3013R2 CU2, there is an undocumented requirement that you need to have BizTalk already configured. If you look in the event log, you will notice this entry, which lead me to the belief that you need to have configured. 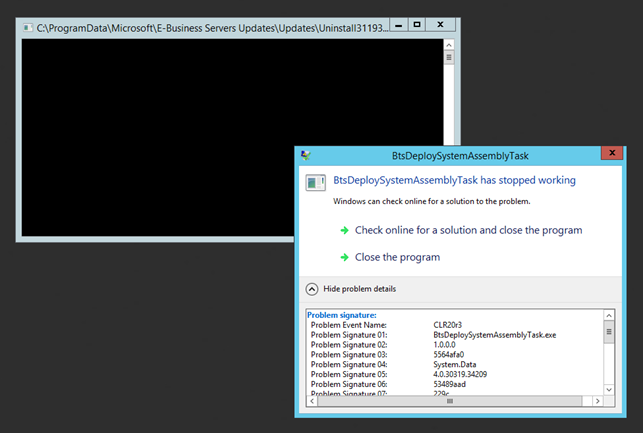 I configured it, ran it and it worked. The download page states nothing about BTS needing to be configured, (To apply this cumulative update package, you must have BizTalk Server 2013 installed. ) nor is the Readme.txt available. I am creating an interface to Constant Contact. I need to get the list numbers the company uses. SSO CreateApplicationFields The parameter is incorrect. However, viagra every time I created an application I would be unable to add any key/values. System.TypeLoadException: Method ‘get_UseXSLTransform’ in type ‘xxxxxxxxxxxx’ from assembly ‘xxxxxxxxxx’ does not have an implementation. Today there is a new version of the CU which does not require a redeploy. I downloaded all of the installation bits into the C:\Images folder. Now that SQL was installed, I can install BizTalk, LOB adapters, and the ESB Toolkit by running the following command, I needed to reference the BizTalkConfig.xml in the setup. To add a new user as an admin to SSAS, you have to import a xmla file. Since my account was already there, I needed to include by my and the NT SERVICE\MSSQLServerOLAPService to the file. I did this by running a powershell command against the template xmla file. I also needed to wait for the powershell script to finish running before going on. The @ping 127.0.0.1 command waits for 5 seconds to finish before going on. I have always struggled with the correct placement of the WITH XMLNAMESPACES statement: I can’t get it in the correct place or ‘escaped’ correctly, so I can never save the stored procedure. So we will show how you can use the methods to deal with XML without having to declare the WITH XMLNAMESPACES statement and in this case we are going to modify the existing value, passing in the variable from the sql statement. Notice that the original xml did not have a namespace prefix (ns0), however I added it to the queries. Also notice in the sql the locations of the single and double quotes. What I have done before is go into each scripting functiod and change the XSLT. – What a pain. Here I am going to show you a ‘trick’ to save yourself the headache. I have always had an issue with a Call Template, “I am creating a template to use, but nothing is ‘reusable’ in my mind” For instance: my output to FName isn’t reusable in any other scenario. We are going to show how it can be reusable! Now if I change the context, I don’t have to remap anything! Since I already have the for-each properly defined all I really need to copy is the children of the OBX_ObservationResult logic to my real map.